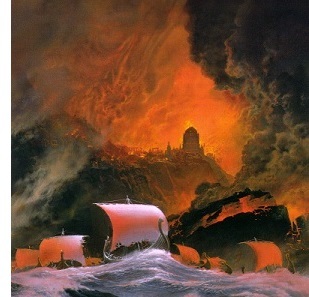 Fall of Númenor (3319 S.A.) - It took decades for Sauron to bring down Númenor, but eventually he succeeded. 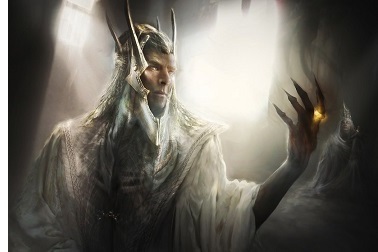 He did so by turning Númenóreans away from the Valar, the enemy of his master, Morgoth. Having discredited the Valar. he sought to replace them with reverence for the original Dark Lord. Finally, Sauron achieved his goal. They even built a temple to Melkor. From that point on, the Númenóreans became oppressors. Now that he effectively ruled Númenor, Sauron intended to use its power against the enemy of his old master, and he played upon the Númenóreans' desire to escape death. And that is what he did. He assembled the mightiest fleet that Númenor had ever mustered. What he did not know, what Sauron never told him, is that the land of the Valar, Aman, cannot be trodden on by mortal man. Ar-Pharazôn sealed the fate not only of his fleet, but of his entire nation. Thus ended the greatest Kingdom of Men of the Second Age.